Ah roasted potatoes. The one dish (other than dessert) that I have a bottomless stomach for. The one food I will actually enjoy as a leftover. Memories of the smell of parsley and garlic filling the house rush through my head. Roasted potatoes have always been my comfort food and the perfect side to a good steak. My brother came to visit recently, and I like to cook both new dishes and dishes that remind us of being back home with our parents. 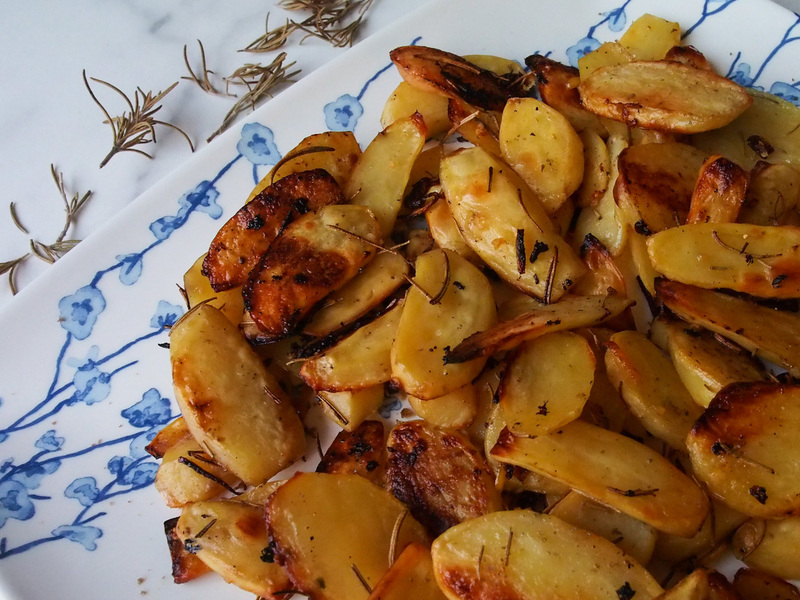 I made these lemon rosemary roasted potatoes as a twist on our mom’s original parsley garlic ones. Preheat the oven to 425°F (215°C). Boil water in a large pot. Add salt. Slice potatoes with a mandolin or cut into 1/4 inch slices. Once the water is boiling, place the potatoes in and cook for 10 min. They should be tender but not too cooked that your knife can go through them easily. Discard water. Place the potatoes on a baking tray lined with parchment paper. Drizzle with olive oil and sprinkle rosemary, lemon peel and garlic. Toss to make sure everything is evenly distributed and that each potato is coated with oil. Bake for about 25 minutes, turning them over half-way through. You can leave them in a little longer if you like them brown with a crispy side like me. Serve with a sprinkle of salt of choice. Leftover are delicious! You can eat them the day after. Will make it tonight! Looks delicious!